How is System State backup useful? 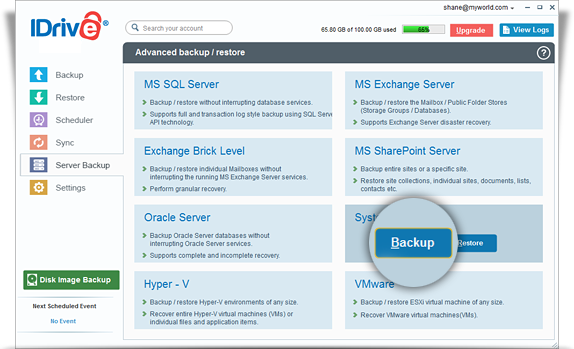 Does IDrive support System State Backup and what is considered for backup? What are the supported Operating Systems for System State Backup? How do I perform the System State Backup? Should I run over the last System state with the new versions? Do I need to close all the running applications/programs to run the System State backup? What is the format of the System State data Backup file? On successful completion of System State Backup, I see a folder 'IDSystemStateData' in my IDrive account. What is it? Can I remove the temporary System State Backup folder from my local computer on completion of backup? Can I add/modify the files in the System State Backup folder 'IDSystemStateData'? How do I restore System state backup components to the original operating system drive? How do I reschedule the System State Backup? Can I select a shared or mapped drive as the temporary destination for my System State Backup? Does IDrive require specific privileges to backup System State data? Do I require an additional/external storage volume for the System State backup? 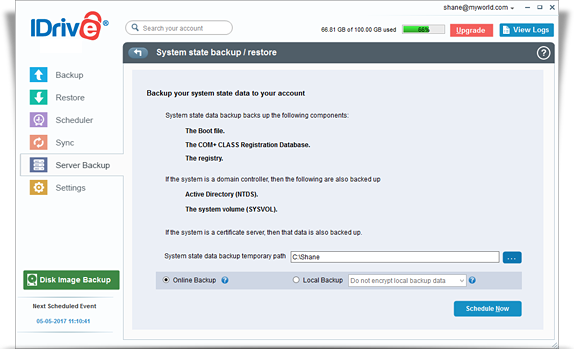 System State backup creates a backup file for critical system related components. This backup file can be used to recover critical system components in case of a crash. Yes, IDrive supports System State data backup. If the system is a certificate server, then the related data is also backed up. Client systems: Windows 2003, Windows 2008, Windows 7, Windows 8. Server systems: Windows Server 2003, Windows Server 2008, Windows Server 2008 R2, Windows Server 2012, Windows Home Server 2012, Windows Web Server 2008. Note: System State Backup is not a replacement for a full disaster recovery solution (which include backup of the entire system including creation of recovery disks). No. It is advisable to keep two or more versions. Thus, even if the last System State is corrupted, you can recover from a previous version. No, you need not close the applications/programs running on your machine while the System State backup is happening. The System State data backup file(s) is in the standard Windows format. On the Windows operating system, the System State data is backed up to folder 'IDSystemStateData'. 'IDSystemStateData' is the System State Backup folder that is created during the System State Backup operation and contains all the backed up data in standard Windows format. Yes. 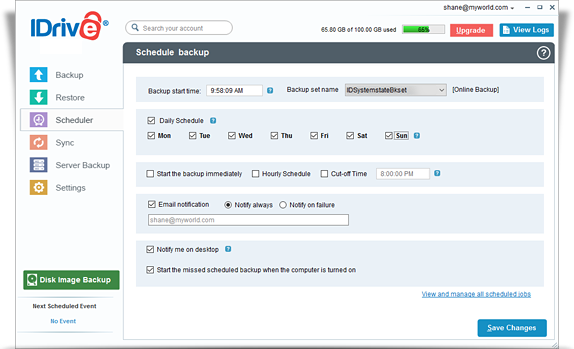 You can remove the temporary System State Backup folder from your local computer on successful completion of the System State backup to your IDrive account. No. It is not advisable to add/modify the files that are present in the System State Backup folder 'IDSystemStateData'. Any modification made to files in this folder would adversely impact your System State restore operations. ​How do I restore System state backup components to the original operating system drive? Navigate to command line from bootable CD. Using xcopy command, copy individual System state backup files / folders components to the original operating system drive. For example: IDrive System state backup folder "IDSystemstateData" contains Windows, ProgramData, Program files etc., folders. You can copy the required files / folders to the original operating system drive. Note: Drive D: is an operating system drive. IDrive creates a backup set called 'IDSystemstateBkset', when you schedule a System State backup operation. Log into IDrive desktop application. Click on the 'Scheduler' tab. Select 'IDSystemstateBkset' from the 'Backup Set name' dropdown. Make the changes by using the check-boxes. No, you cannot select a shared or mapped drive as the temporary destination, for the System State Backup. Yes, you should have the administrative privileges to perform the System State data backup. No, you do not require any additional or external storage to take the System State backup using IDrive. Ensure that the temporary folder set while scheduling System State backup has enough free space.